In over twenty years as a pastor, there are some things that you never get used to. Yesterday, I visited in the home of a member of our church who is dying of cancer. With his wife on one side of the hospital bed and me on the other, the three of us prayed together and wept together. This particular couple have been dear friends of ours during our years in Huntsville. I cried when I was them, and I cried when I got into my car. I cried as I drove back to my office. Even though they are strong believers, the sadness is profound. Today, I conducted the funeral of another member of our church. She was a beloved wife, mother, grandmother, church member, neighbor, and friend. Typically the funeral director gathers the family together a few minutes before the service starts so that the family can have a final private viewing. Many times, these are the most emotional moments for families. Today was no different. During this time before the funeral, we wept together and prayed together. In addition, there are the ministry situations that I cannot share on this blog. These are the heartbreaking situations that lead people to talk with a pastor. The pain is just as real, even though no death is involved. I pray with everyone who comes to see me. Sometimes I cry with the person as I pray with them. I’ve had a few of those situations as well recently. When I first started out in ministry, I used to think that it was a necessity to have something profound to say in these situations. No more. The truth is that oftentimes weeping with those that weep means more than anything. Is there an issue in your life where you really struggle to trust God completely? Scripture affirms over and over again that we are to trust Him. “Have faith in God,” “Trust in the Lord” form the keynote and foundation of prayer. Primarily, it is not trust in the Word of God, but rather trust in the Person of God. For trust in the Person of God must precede trust in the Word of God…Trust, in an historical fact or in a mere record may be a very passive thing, but trust in a person vitalizes the quality, fructifies it, informs it with love. The trust which informs prayer centers in a Person. I believe that Bounds is exactly right to link our trust to our prayer life. Think about it. If there is a person in your life that you don’t trust, it’s difficult to have much of a relationship with them. You might be required to talk with them in your job or they might be a member of your family, but the reality is that you will go through the motions in your interaction with that person because ultimately you are not assured that they are acting your best interest or even have your best interests at heart. Where there is not love, there cannot be trust. Ultimately our perception of a person’s love for us determines our capacity to trust them. What does this have to do with prayer? Everything! What does prayer have to do with trusting God? Everything! Remember, where there is not love, there cannot be trust. However, there is another side of that coin – where there is love, there can be trust. We can trust God first and foremost because God loves us. You see, the basis of our trusting God is His faithful love for us! If we believe with all of our heart that God loves us, then we can trust Him with all of our heart. If I know God loves me, then I also know that He will always act in my best interest. Therefore, I can trust Him. Love and trust are intertwined. If I am assured of love, then I can trust. We are assured of His love, therefore we can trust Him. Because we trust Him, we talk to God in prayer. The more we talk to God in prayer, the more we are assured of His love. The more we are assured of His live, the more we pray. And the more we pray…well, you get the idea. It goes like this..
Are you struggling to trust God this Monday morning? Rest assured of His love and start praying! Yesterday was Valentine’s Day. Like many husbands, I got my lovely wife a sweet card and took her to her favorite restaurant to eat for Valentine’s Day. To be very honest, Valentine’s Day is the easiest day of the year to show love and appreciation because everyone is doing it. Every store you go into has tangible reminders with cards, candy, and gifts conveniently displayed. But what about the day after Valentine’s Day? What about showing love every day? The truth is that real love doesn’t just happen on a certain day. Real love happens every day. Real love happens in the small everyday things as well as in the big holidays. The verse I quote above is a great reminder that our love really is ultimately shown by our integrity and our deeds. Words are cheap but deeds cost us and integrity is priceless. The problem in so many marriages isn’t that there is not enough love shown on Valentine’s Day, but rather there is not enough love in the other days of the year. So, what about the day after Valentines Day? Let it be a great reminder of what true love involves every single day – deeds and truth! By the way, 1 John 4:7-12 says that the pattern for love like this is found in the love of God through our Savior Jesus Christ. The cross where Jesus died for our sins is the ultimate expression of love in both deed and truth. It is only through the great love of God that we sinful human beings are capable of loving in the same way. Show love today – in deed and truth! Adrian Rogers remains one of the most influential people in my life. Other than the Words of God in the Bible, the words of Adrian Rogers have influenced me more than any other. There is literally not a single day that I do not think of Dr. Rogers and something I have learned from him. Were we close friends? No. Actually I only had the privilege of talking with him on one occasion. What I have learned from him, I gleaned from a three day pastor’s conference that he led and from near countless sermons I have heard him preach. Still, his impact on my life is incalculable. Just this morning, I quoted him in a conversation. Dr. Adrian Rogers, a well-known pastor and leader in the Southern Baptist Convention, went home to be with the Lord on November 15, 2005. While I will not be among the thousands who will be present at his funeral service, I decided to honor Dr. Rogers among my church family and others that I have contact with by sharing my thoughts about a man that I had the opportunity to meet up close and personal. Fast forward to the Fall of 2003. I was privileged to be one of 50 pastors that Dr. Rogers invited to spend three days with him in Memphis. I preached that Sunday morning at the church I was serving as pastor, hopped into my car, and took off to Bellevue Baptist Church in Memphis for the evening worship service. It was an incredible service and Dr. Rogers preached a tremendous message. There were three or four other pastors who arrived early for the conference to attend the evening service. To our surprise, an announcement was made at the end of the service that Dr. Rogers would like to meet in his office with any pastors who were present. We were escorted into his office. Of course, it was very large and tastefully decorated. Behind his desk were portraits of Dr. Rogers with three different United States Presidents. However, the thing that I remember most about his office was the visitor who was there when we entered – a truck driver. As a child, this man had been saved and baptized at Bellevue early on in Dr. Rogers’ ministry there. He had not been to Bellevue or seen Dr. Rogers since he was a child. In fact, he was not even planning on being at Bellevue that night. His rig had broken down in Memphis, and it was going to be the next morning before he was going to be able to resume his trip. So, in his work clothes, he took a taxi to Bellevue for the Sunday night service and wound up getting invited to visit with Dr. Rogers in his office. It impressed me that Dr. Rogers would do that. He only spent about ten minutes with that man, but it was ten minutes that man will never forget. Even though thousands were present that night at church, Adrian Rogers took a few minutes to talk to a truck driver he had not seen in years. When the pastor’s conference started the next morning, I was again pleasantly surprised. Dr. Rogers had cleared his calendar for three days for us. Yes, he taught us during the sessions, but he also stood out in the hallway with us during the breaks. He ate meals with us. He arrived early to talk with people and he left late after talking with people. He had a way of making each person that he talked with feel like the most important person in the building. Speaking of the sessions, they turned out to be the opposite of what I expected. For three days, Dr. Rogers never talked to us about “how to grow a big church.” Instead, he talked with us about the pastor’s prayer life and personal integrity. He talked about the pastor’s family life – “the ministry that doesn’t begin at home doesn’t begin.” He taught us about expository preaching and how important it was to invest our lives in preaching the Word – “the Bible will get the job done.” He opened up and shared with us deeply personal stories of the tragedies and triumphs of his fifty years in ministry. He shared with us about times when he failed as a husband and struggled as a father. He shared with us about the times when he was not happy at the church he was serving. He told us about times when he had been hurt. There was not a dry eye in the house when he and his wife Joyce talked about the heart break of burying their infant son. Another attribute that impressed me was the fact that Adrian Rogers was comfortable in his own skin. He did not try to act as if he was not a well-known pastor who led one of the largest ministries in the world. Yet, his genuine humility shined through at every turn. There was absolutely no hint of taking credit or putting on airs. He was humble, real, and personable. On the closing night of conference, we had a formal banquet. A friend and I sat down at a table and begin talking when I felt a hand on my shoulder. “May we join you?” Dr. Rogers asked as he sat down with his wife. So, I literally ate a meal elbow to elbow with Adrian Rogers. We did not talk about Bellevue or his ministry. He asked about my wife and children. He wanted to know all about them. He asked about my church and how things were going. I had dinner with Adrian Rogers and he wanted to talk about me. When I arrived home the next day, I wrote Dr. Rogers and thanked him for three of the best days of my life. On a recent trip, I listened to most of the tapes of those sessions again. Once again, I laughed and cried and prayed as I listened to Adrian Rogers remind me that the most important things about a pastor are not the size of his church and the number of baptisms. Now that he has gone on to be with the Lord, I will probably listen to them again very soon. They are priceless. I am so thankful that I had the opportunity to get to know Adrian Rogers the man. He was so much more than a powerful preacher and a strong leader. He was a husband who stayed faithful to his wife and loved her more the longer he was married to her. He was a father who would quickly let you know how proud he was of his children, and, when it was time to have dinner with them, he showed you to the door! They were important. He preached with great boldness but on a personal level he was humble, loving, and sincere. He loved Christ with all of his heart. He served the church with all of his might. He preached to thousands from one of the most prestigious pulpits in the world, and yet he took time to talk to truck drivers and young preachers from Alabama. There was never a hint of scandal or immorality in all of his years as a pastor. He was faithful to his Lord, his family, and his church. In a day when so many fell, he stood. In a day when so many quit, he finished. It was never about Adrian, but it was always about Jesus. Whenever he stepped into the pulpit, he did not have a sermon – he brought a message. He preached from the heart – with all of his heart. He lived what he preached. And then he died. 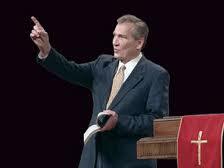 I want to be like Adrian Rogers.